Welcome to Cable Design Tool, this webapp allows you to draw cable assemblies and request a quote. The capabilities of the app allow for designing from quite complex cable looms down to Simple Connector to unterminated wires. 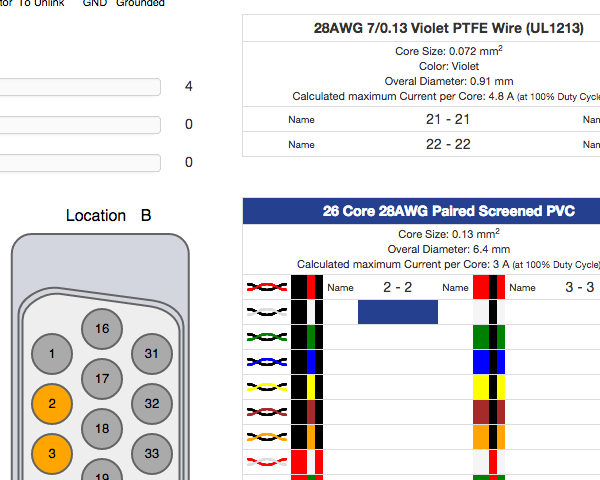 Everything is editable, Pinouts, lengths, bundling, you can even specify connectors and wires which aren't in our database, just specify the number of pins / wires and some basic specifications. The application is designed to work on a Desktop or Laptop Computer, although it functions well on mobile devices. 3. Add the desired number of paths for the whole assembly using [Add Path]. 4. Move the paths roughly to the positions desired (click on the middle of a path to drag the whole thing). 5. Connect the ends of the paths to connectors. A green dot appears when the path end is in the correct position for connecting. Any unterminated locations are just path ends and don’t need to be connected to a connector. 6. 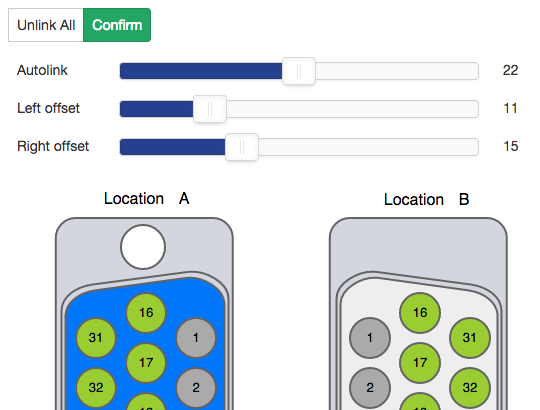 Select the connector type: Click on a connector, click [Connector] and select a connector from the list. 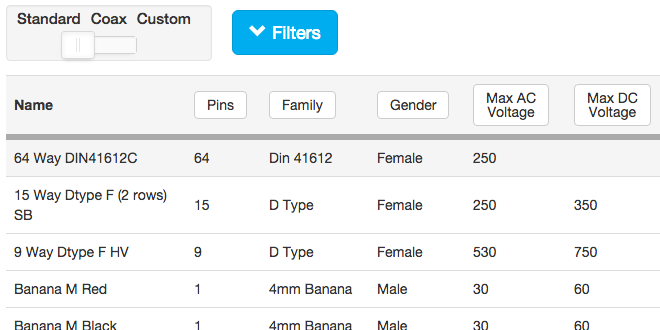 The list is very long, so the click [Filters] to enable filtering of the connector list. This needs to be repeated for each connector, although a different approach is to add a single connector, set its type and use the [Duplicate] button to produce an identical copy. 8. Once the backshell is selected the connector can be turned over by clicking on [Flip] (Only really useful on side and 45 degree exit backshells). 10. If a path uses single core wires or multiple multicore wires, then normally sleeving is added, this can be achieved by clicking [Select Sleeve] and choosing the desired sleeving type. 11. 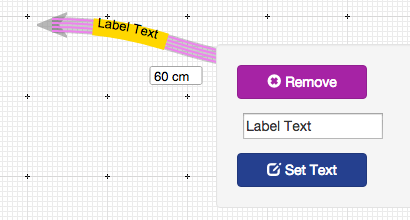 To set the lengths of the paths, click on a path and select [Set Length]. Enter the length required in the pop-up window. 12. If any labeling is required on the cable, click on a path and select [Add Label] (This button is greyed out if there are no wires added to the path). A label is added to the path. To edit the text, click on the label, a text box appears, type the desired text, and click [Set Text]. The label can be dragged along the path to the desired position. 13. (Optional Step) Connectors can be named if desired (these automatically default to letters). To name a connector, click on a connector and select [Name], enter text in the pop-up window, and click [Set] to confirm. 14. Linking Pins: Click on a path (which already has the wires selected), click [Link Pins]. A new page opens, Representations of the location at each end of the cable are displayed, and any wires/multicore cables selected for that path. 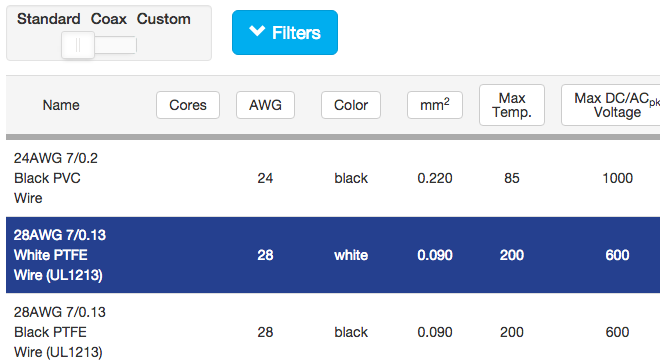 Select the wire/multicore you want to use. Then click the pin you want to link to on the right corner. b) In the wire/multicore section, cores can be named, just click on the text “Name”, add the core name, and click the tick to confirm. c) Autolinker: To speed up the linking process, the Autolink slider will link many wires in one step. 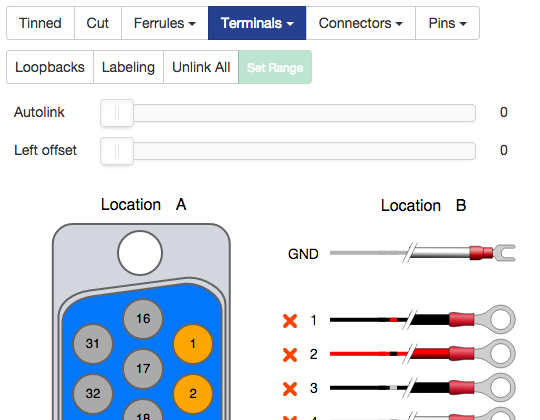 Select the wire/multicore you wish to link, move the Autolink slider to the number of pins you want to link, use the Offset sliders to set the starting pins on the left and right connectors, Click Confirm to link the pins. d) If your path has an Unterminated Location the process is similar to connector-connector linking, but there are further options on the unterminated end. Wires can be cut, tinned or have ferrules/terminals/pins added to one, more or all pins. Above the Autolink slider there are buttons for selecting the above options, set this before linking and it will be applied to all cores linked. If you want to change an individual wire to something else, then click on the wire you want to change, and click the button for the termination required. e) Screening Options for a path can be set (assuming the cable has screening, or the path has screening braid on it), using the box below the wire types. Screening can be connected to either end of the cable or both ends. It can also be connected to any pins on either connector. Click on the tickbox to cycle through the options. f. If Sleeving is on an unterminated path, the length of the loose wire section can be set. Go to the main drawing page, and click on the unterminated location. Use the [Set Length] button to set the length. 15. (Optional Step) Comments can be added by clicking on a connector or path, and selecting [Add Comment]. A comment box appears, click on the comment box to change the text. Comments can be used for your reference, or to communicate desired features of the cable assembly, which the Cable Design Toolis currently unable to represent. a) [Overwrite], replaces the saved drawing with the modified one. b) Clicking [Account] and then [New Revision], creates a new revision of the cable. On the load page, both versions are available to load and the revisions are linked with a blue line. c) Clicking [Account] and then [Save as a new Cable], creates a new cable. 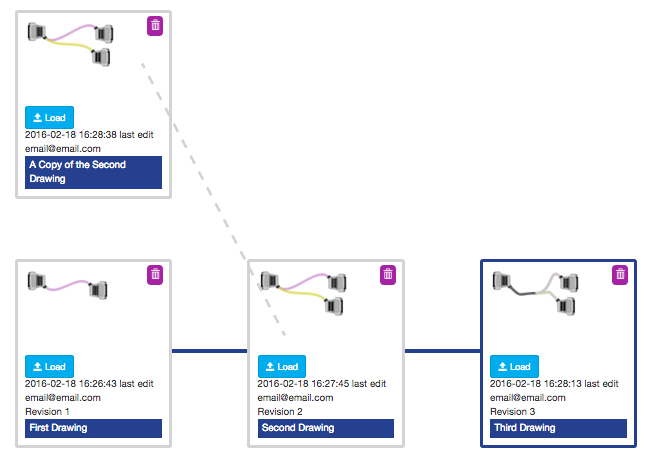 On the load page, this new cable won’t be linked to the drawing it was created from, although they are linked by a dashed line to show the revision fork. d) Submitting you assembly for quoting. 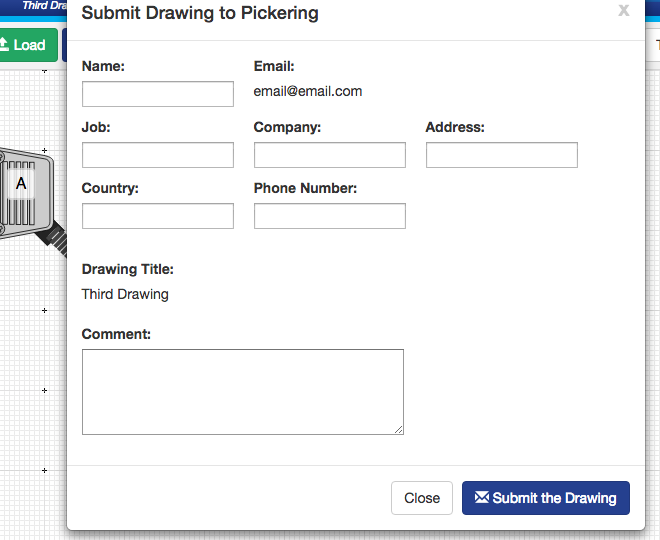 Clicking [Account] and then [Submit to Pickering]. This sendsa copy of the drawing to a technician at Pickeringwho will contact you with a quoteor any questions if the drawing is not clear to us. 17. Paths can be bundled together if required, click [Merge Paths] then select 2 or more paths you want to bundle together, then click [Merge Paths] again to confirm.